How is the bromination of alkenes best represented? Text-books and the bromination of ethene. There is often a disconnect between how a text-book (schematically) represents a reaction and a more quantitive “reality” revealed by quantum mechanics. Is the bromination of ethene to give 1,2-dibromoethane one such example? Text-books will show how ethene interacts with bromine to form a cyclic bromonium cation, which with the liberated bromide anion makes for an ion-pair. 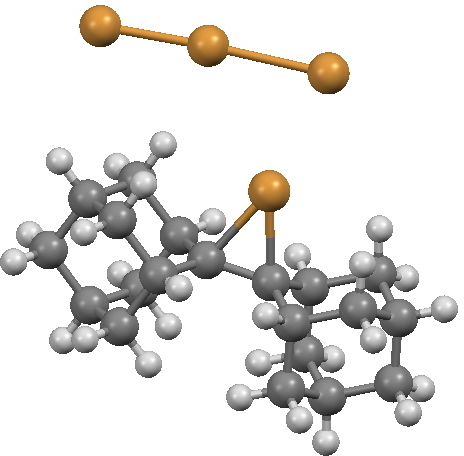 Using quantum mechanics (DFT ωB97XT/6-311G(d,p)/SCRF=dichloromethane), one soon realises that the ion-pair will need to be stabilised, both by solvation and possibly by interacting the bromide anion with a further bromine to form a tribromide anion (as shown above). A transition state for this process can indeed be located, and this is shown below, together with the IRC for the process. The barrier (~ 7 kcal/mol) is appropriately small for what is a rapid reaction. The ion-pair formed is only stable by ~ 1 kcal/mol towards a reverse reaction. 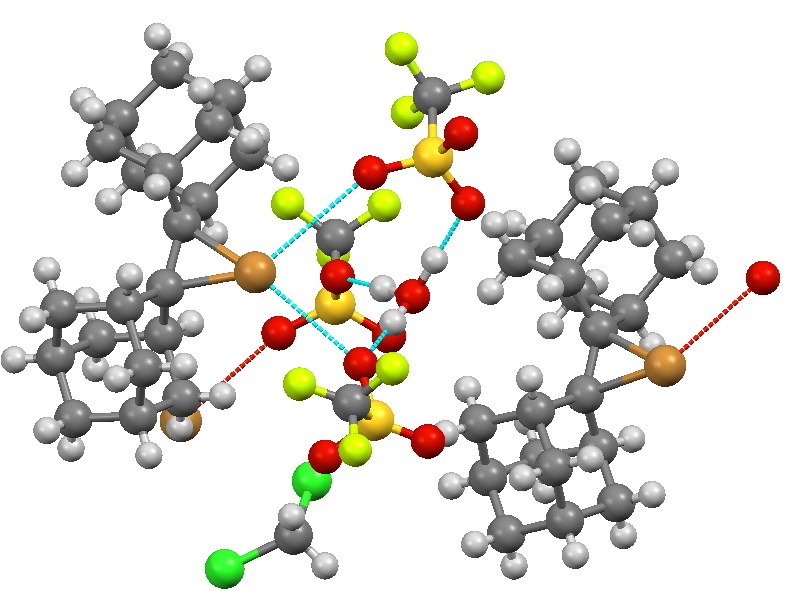 Here however, the limitations of this relatively simple solvation model (a continuum solvent and an extra bromine molecule) may be under-estimating its stability. The interesting bit comes next. The ion-pair has got to relocate itself to a position where the tribromide anion can back-side attack the bromonium cation.‡ Ion-pairs are unlike normal molecules, where covalent bonds determine fairly clearly what the geometry and its conformations might be. There are no straightforward rules for establishing what the geometry of an ion-pair might be, or indeed what its energy relative to other poses might be, other than perhaps simply minimising its dipole moment. In this example, quantum mechanics tells us that in fact the ion-pair is about 2 kcal/mol MORE stable in its new location, and so it can presumably diffuse over with a clear driving force.† Once it is back-side located, the reaction completes without any enthalpic barrier; it is downhill all the way! This is a fairly simple model for the reaction between bromine and ethene. Modelling it however is not that simple. Any reaction which undergoes a transition from covalency to ionicity in one or more bond is always a challenge. And ionic systems may not always be best represented by (non-statistical) models which include only one molecule (as is the case with ionic solids). But the picture I have shown here takes the text-book schemes up one level, and we now have at least an estimate of the energies involved, as well as geometries. † The geometry of TS2 is shown below. It has a dipole moment of 19.3D and is some 9.6 kcal/mol in ΔG above TS1, which has a dipole moment of 18.7D. It may of course not be the lowest energy pathway for reorganisation of the ion-pair. 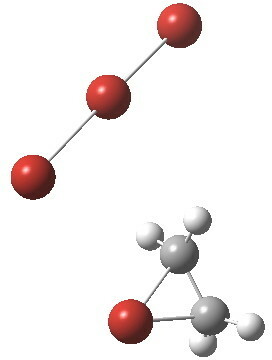 Crystal structure of a bromonium cation-tribromide anion pair. Click for 3D. It is also possible to isolate the bromonium cation using a different counter-anion, by the same subterfuge of steric hindrance. 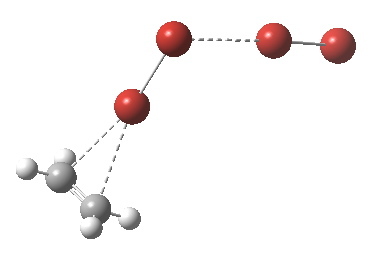 This structure also is unusual in revealing an isolated hydronium ion cation, H3O+. This entry was posted on Sunday, October 14th, 2012 at 2:31 pm and is filed under Interesting chemistry. You can follow any responses to this entry through the RSS 2.0 feed. You can leave a response, or trackback from your own site. I have had an email asking about the (free energy, ΔG298) barriers I computed for the bromination of ethene. Recollect that the reactants are non polar, whereas TS1 has a dipole moment of 18.7D. Thus the barrier should be expected to be very sensitive to the solvent. In dichloromethane, the solvent I used in the above simulation, the value of ΔG starting from the complex formed from 2Br2 and ethene (see discussion of those species at this review, DOI: 10.1002/chem.200390097) is 11.5 kcal/mol. Separating these three components to infinite distance raises this to 20.0 kcal/mol due to greater loss of entropy. These values still essentially correspond to a reasonably rapid room temperature reaction. But change the solvent to tetrachloromethane (which is very non-polar), the free energy values rise to 22.5 and 30.8 kcal/mol respectively, which now corresponds to a slow reaction. The rate of reaction is thus predicted to be very sensitive to solvent. Experts tell me that when pure in CXl4 solution and in the dark, ethene does not react with molecular bromine (or only extremely slowly). The second Br2 nolecule acts as a catalyst,as you show, but it also must help in getting a bromide ion moiety around to the back side to enable trans addition. You don’t show how this happens in non-ionizing media like CCl4. Why doesn’t Br2 simply add cis to ethene? What is the energy difference between cis and trans addition in non-polar media? See:JCPA, 2007, 111, 13218 for extremely high computed barriers, and much detail. I do not have a direct answer for you for the bromination of ethene, but I do have numbers for the syn and anti E2 elimination of chloroethane by chloride anion acting as a base; 4.3 kcal/mol lower in free energy for the anti transition state. Last night I saw the mechanism of this kind of reaction in a text book. And years after what my organic teachers taught me I give it a try to do some calculations about the TS. I coudn’t stabilize the bromide anion. Searching in google I came across with your information. Thank you! Text-books and the bromination of ethene. is licensed by Henry Rzepa under a Creative Commons Attribution-Noncommercial-Share Alike 3.0 United States License.